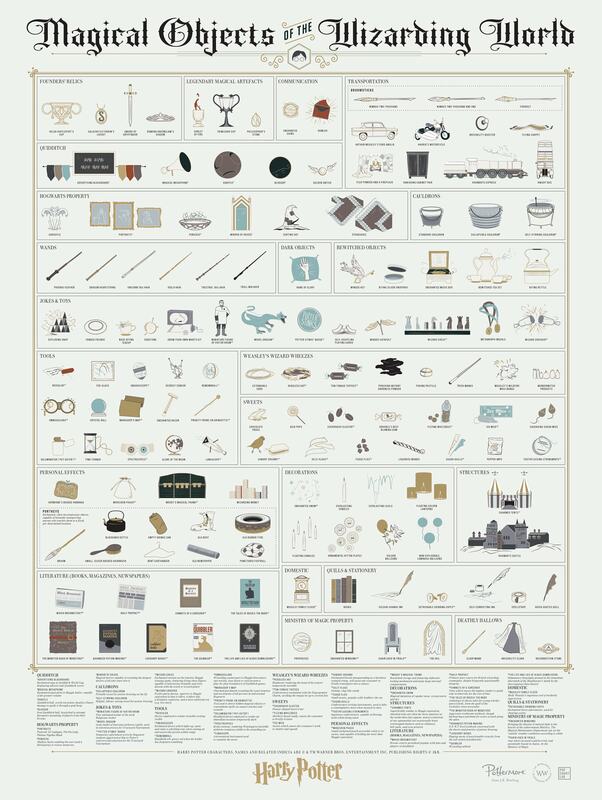 The following infographic details all the many magical objects from the Harry Potter books and movies, including wands, vehicles, buildings, candy, and weapons. There are more than sixty items on this chart, and they're arranged according to utility, ownership, and their supernatural properties. For example, the moving staircases, the Sorting Hat, and moving portraits are grouped under "Hogwarts Property", while Deathly Hallows items like the Resurrection Stone, Elder Wand, and the invisibility cloak receive their own category, and the flying Ford Anglia, Hagrid's motorcycle, and the Hogwarts Express are all grouped under "Transportation". The infographic is also available as a $30 wall poster.